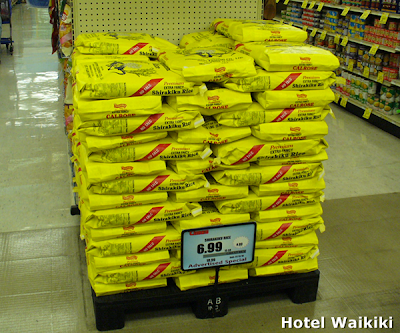 I finally realized that I've been buying rice in 15-lbs bags. I thought they were 20-lbs bags. At any rate, remember what seemed like only a few years ago, rice prices started escalating through the roof, so they soon stopped selling 25-lbs bags of rice, and downsized the bags to 20-lbs sizes to spare consumers the sticker shock of what is as much our island's staple as it's counterpart of spaghetti or potatoes or bread or pop corn in other regions of the US where starch is part of a meal. Well, now the 20-lbs bag of rice have gone the way of it's predecessor, the 25-lbs bag of rice, and in place of the 20-lbs bags, we now have a 15-lbs bag. I didn't realize that until today. Yeah, I know. .... this ought to make people on the mainland grin, or laugh. 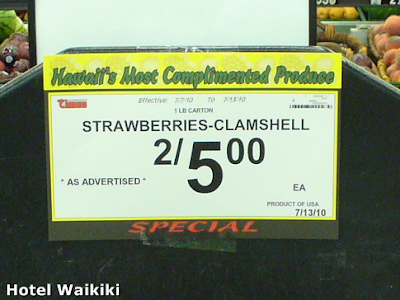 An entire pound of fresh strawberries advertised on sale for $2.50. 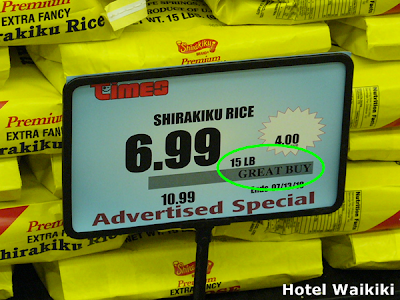 Yes, I know how expensive rice is these days. Also, we only buy brown rice. It's funny how it's not as processed so requires less work (doesn't it?) but they charge more. Kay- after having lived some 50 or so years in Illinois, I'd thought you'd be a potato person by now. Just kiddin. Thanks for preparing me for the sticker shock when I go back for another visit, which, by the time that ever happens, rice bags will be down to 10 lbs and still touted as a great buy. Rowena- now they get excuse for charging high price for fried rice. Risotto even more expensive. $2.50 strawberries. That's a good price. I hadn't noticed the 15 lb. bag size. I could swear it was 20lbs at the Longs on Saturday. They were building rice sandcastles for a food drive. 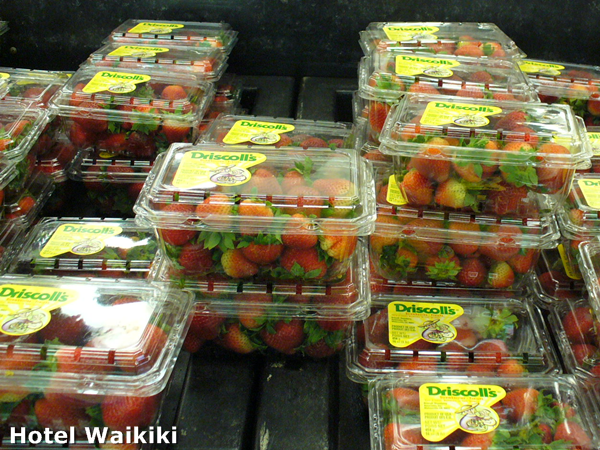 kahuku- well, $2.50 for unripe strawberries? I know that you can't pick em ripe unless they're genetically modified to never over-ripen.